Huge Honour to get my first cover with 'Slim, Fit & Healthy Magazine' - June 2018 Issue. You can read all about my journey from 21 Stone to a nutritionist in this issue - out now! Could intermittent fasting help us loose weight and have health benefits? Intermittent fasting generally means that you consume your calories during a specific window of the day, and choose not to eat food for a larger window of time. New research into fasting is turning conventional nutrition advice on its head challenging tradition recommendations such as always have breakfast, eat little and often, and never go hungry. Some studies are showing reduced risk factors for ageing and diseases including diabetes, cardiovascular disease and cancer, whilst benefits include reduced level of systemic inflammation and visceral fat when using intermittent fasting. Amie Richmond agrees, saying “there is mounting scientific evidence to support intermittent fasting”. Nonetheless, fasting isn’t for everyone, and depending on your health and lifestyle circumstances does need to be recommended by a qualified and experience practitioner. If your goal is fat loss rather than fitness Amie says that intermittent fasting can be very effective. “In order to fast for 12-16 hours you should ideally do this overnight rather than during the day when you require extra energy and it’s important not to fast daily as it can increase stress and elevate cortisol levels when done too often”. 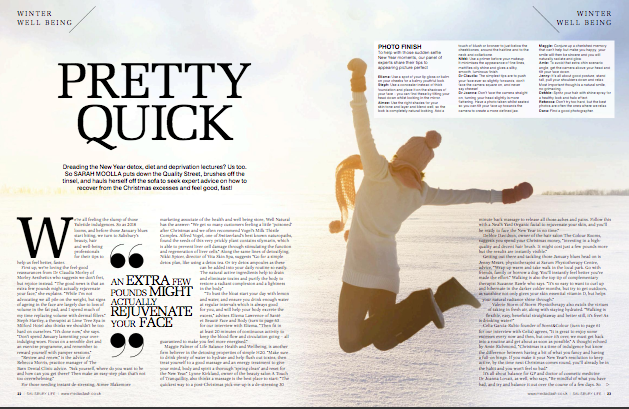 How to recover from the Christmas excesses and feel good fast! "Christmas is a time of indulgence but know the difference between having a bit of what you fancy and having a full-on binge. If you make it your New Year's resolution to keep active, by the time next Christmas comes around, you'll already be in the habit and you won't feel so bad." Amie Richmond also thinks we should be kinder to ourselves, "If you look in the mirror and have harsh thoughts about yourself, then stop and think, would you say the same thing out loud to someone you loved?" And for a bit of fun... On New Year Selfies - Amie say "To avoid that extra chin sceanrio angle, get the camera above your head and tilt your face down." Amie Richmond from Salisbury’s nutrition support group My Body Fabulous, hosted a Sugar Free Bake Off event at Parkwood Health and Fitness recently for Macmillan Cancer Support. Weighing yourself is rarely fun. You haul the weighing scales out onto the cold bathroom floor, you take off all your clothes – in case your socks add on unnecessary pounds – you screw your eyes shut… and step on. When you’re looking to lose weight, weigh-ins like this, however traumatic, can become almost addictive. You think, “I passed on the chocolate cake at dinner last night and went for a run – I must be down a few notches?” Alas no. This obsessive approach to tracking weight loss can be ineffective and you can be doing yourself a disservice by not taking the proper steps. So, to help you out, MACROS have spoken to several experts to find out the best way to weigh yourself and keep on top of your progress. When should we weigh ourselves? It’s universally acknowledged that you should weigh yourself when you wake up in the morning after going to the loo, so both your stomach and bladder are empty. This way you’ll be at your lightest before you’ve consumed any food and drink which will add weight to your body. Indeed, the day itself is significant. Amie Richmond, a nutritionist, wellness coach and founder of UK-based My Body Fabulous health clinic, says, “Professionally speaking I recommend picking one day a week to check on your weight and to monitor your fat loss. I don’t agree with Monday morning weigh-ins as our calorie consumption over the weekends can increase and lead to temporary weight gain. How often should we weigh ourselves? As tempting as it may be when you’re nailing the healthy eating and exercise, daily weigh-ins are inadvisable. “The body’s weight can fluctuate due to varying factors such as stress, heat, or even the time of month for females,” says Luke. “Once a week should give you an accurate reading of your progress, but if you need to do it more, pick days with space between them, for instance, Monday and Thursday. How much fluctuation can we expect? Although our body might not look different throughout the day, our weight can fluctuate a surprising amount. Both men and women experience this but ladies can observe greater monthly fluctuations, especially if they bloat around menstruation. What’s the best way to track weight loss? Buying your own weighing scales may seem like the most effortless option when it comes to monitoring weight loss but the experts advise against this. Other options can vary from simply taking photos of yourself to caliper measurements – which can often be carried out at your local gym – and even underwater hydrostatic body fat assessment which is the most accurate but unfortunately not very practical. Harriet Mallinson Harriet is Editor of MACROS and perfectly capable of eating an entire log of goat’s cheese in one sitting. Top dermatologists weigh in on which acne treatments really work. In this article, we break down and investigate a wide range of treatments - from adjusting your diet, to applying different kinds of topical creams, with the hope that you might find the right sort of solution to suit you and your lifestyle. But first, is there a different treatment for teenage acne as opposed to adult acne? "The conventional acne treatment for teenagers is to dry them out and get rid of the oil," says dermatologist Dennis Gross, MD, and although we have less sebum as we age, the oil we do have turns into a pore-clogging glue. "Adult acne is the result of a problem with the oil chemistry," he says. "As hormones change, oil does too, becoming more viscous and as it flows through the gland and out through the pore, it gets stuck." So how can we banish those sore, unsightly bumps for good? While facialists have bashed dairy for decades, clinical studies have only recently established a link between milk consumption and acne. "Milk contains testosterone precursors, which cause increased sebum production," says dermatologist Francesca Fusco, MD. "What's fascinating is that one study found that of all milk, skim milk has the strongest correlation with acne, and some hypothesise that skim milk has less oestrogen than whole milk." The thing is, switching to organic milk won't remove your exposure. "All milk naturally contains androgens and IGF-1 [Insulin-like Growth Factor 1, a hormone that may be a precursor to breakouts]," Mariwalla says. "There's no such thing as hormone-free milk. Plus, milk contains sugar, a lactose, so it stimulates insulin." If you just can't bear to banish milk from your diet completely, nutritionist and wellness coach Amie Richmond suggests opting for nut, rice or oat milks instead - and the same goes for yogurt. "Replacing milk and yogurts with coconut-based, dairy free varieties will not only help eliminate the compounds that trigger acne, but they have the added benefit of high protein levels which is great for your overall health." Another recent study suggests that following a low glycaemic index diet—that means one with less refined sugars, carbohydrates, and sugar-containing foods—may result in fewer acne outbreaks. "As the glycaemic index goes up, it affects insulin production and all the hormones," Fusco says. "They are all in a delicate balance—your female hormones are in balance with your thyroid hormones, which are in balance with your insulin. When you have more in one area, it's like a domino effect on the others." Since the dietary acne provoker may vary for every person, New York dermatologist Ellen Marmur, MD, recommends keeping a food diary outlining what you eat in the days before a breakout to determine what your triggers are. "Then you start a very slow re-entry, introducing one new item, like dairy, every six weeks to see what happens on the skin," says Marmur, who believes that it takes just 48 hours for what you eat to show up on your face. Now we know which types of food to avoid, which groups should we be adding to our daily diet? "Probiotic rich foods such as oats, chia seeds and sauerkraut, not to mention dark leafy greens like kale, broccoli and cabbage, will help eliminate the toxins that cause acne," say both Richmond and Matt Plowman, of Cardiff Sports Nutrition. "Foods packed with zinc, like pumpkin seeds, chia seeds and flaxseeds are also great at boosting immunity to the bacteria that causes spots, but it's food that is high in skin-healing vitamin A, such as spinach and carrots, that is even better. Don't bank on expensive treatments and creams - it's best to start from the inside." While it may sound like a cliche, not drinking enough water is detrimental to your skin's health. "Acne can be a result of toxins leaving the body," says Richmond, "so sipping on water throughout the day helps flush these toxins out. That said, it's important that the water you drink has been through a carbon filter. "Tap water in the UK contains a number of added chemicals which can contribute to toxin production." Historically, the premier hormonal mediator has always been the birth control pill, which works by lowering your body's testosterone levels - the male hormone that increases oil production - but this doesn't have to be your first line of defence. Marmur points out that while the Pill may clear up acne, it can also provoke another unsightly reaction: melasma, a noticeable discoloration of the skin that she says is on par with acne in her practice as a top complexion complaint, not to mention mood swings, weight gain, weight loss and headaches. If you do opt for the Pill, figure out an exit strategy first. "Birth control pills can be very effective, but eight or nine times out of ten, when you stop them, you are right back where you started," says Bank, and that's where Spironolactone comes in. "This a actually medication that was initially developed for blood pressure and heart failure," says Dr. Anjali Mahto, Consultant Dermatologist and British Skin Foundation spokesperson, "but we have evidence that it works in female adult acne by local attention on hormones in the skin." Like many spot sufferers, Bank is also a big fan of Accutane, the prescription-only vitamin A–derived pill, because it continues to work after you stop using it. "Accutane is still, hands-down, our most effective, lasting antipimple medication," he says, and the results speak for themselves. Although an Accutane prescription - which you can get from your GP - comes with significant FDA regulation (because of possible birth defects, patients have to agree to use two forms of birth control and undergo regular pregnancy tests during treatment and for one month after), most of the derms we interviewed believe it to be worth the trouble. "After you stop the medication, many people have a durable response for many, many years," Mariwalla says. And we can't forget the buzz surrounding antibiotics. "There is definitely a move away from them," says consultant dermatologist Dr. Justine Hextall FRCP. "We are seeing antibiotic resitant P acnes, and while a short course of Tetracycline may be prescribed, there is little evidence that long courses confer much benefit. That's why I prefer topical treatments." Gold-standard topical acne fighters such as retinoids, benzoyl peroxide, and salicylic acid remain the solutions most frequently name-checked by our dermatologists and Mahto reveals that using retinoids are one of the most effective treatments for acne prone skin. "Retinoids, or vitamin A, stimulates collagen production and exfoliates the top layers of skin cells. This really helps to reduce the formation of both whiteheads and blackheads, and improves pigmentation or staining in the skin left behind by acne." And according to Consultant Dermatologist Justine Hextall, a combination of spot treatment benzyol perozide and retinoids is even better. "Interestingly, recent studies have shown that benzyol peroxide can help to prevent antibiotic resistance in acne, but you have to be savvy. It dramatically reduces vitamin E, another important anti-oxidant in skin, so make sure you apply a moisturiser packed with the stuff half an hour later for a healthy, happy complexion." Found in a myriad of affordable, over-the-counter spot creams, gels and pastes, exfoliant salicylic acid is favoured by many dermatologists for its ability to help break down the outer layer of skin, so it doesn't mix with sebum, while speeding up the resolution of whiteheads. "It's also a common agent in chemical peels which I'd suggest for sufferers with modrate to mild acne," says Mahto. "It helps to banish acne lesions, pigmentary change and to diminish superficial scars." And there's a new kid on the block - Azelaic Acid. "This is the new skincare buzzword ingredient," says Rodial's Jon Rummins. "It is anti-bacterial and, at the same time, provides an anti-inflammatory soothing action, which is why we have added it to the Super Acid Rush Peel alongside dead skin-lifting Glycolic Acid. Together, they treat the skin without sensitising, helping to diminish acne considerably." Although, as Marmur notes, it takes only two days for a pimple to crop up, you need to give any topical preventive measure 42 days to kick in. "The lifespan of a pimple is about six weeks, so that's the magic number for how long you should give a product before you give up," she says. As far as picking goes, it's hard to resist the lure of the magnifying mirror, that evil contraption that turns every pore into a crater. But while it may appear that your clogged pores number in the thousands, many of those little dots, particularly on the nose, are entirely normal hair follicles. Resist the urge to squeeze; leave extractions to the professionals. "If you have a well-trained medical aesthetician working under the auspice of a derm, they can use acne extractors or microneedles to actually get in there for the more difficult whiteheads," says Neil Sadick, MD. Dermatologist Hextall agrees: "Often, traditional acne treatments quickly clear the typical papules and pustules but the comedones remain. I have found that microneedling is getting very good results, so book in with a dermatologists if you have constant flare-ups." All this talk of needles might make you feel a little queasy, but the proof is in the clear skin. In fact, Mahto even suggests opting for a steroid injection, especially for single, isolated, stubborn acne lesions such as cysts. "This method is particularly useful is a quick response is required, for example, if you have an upcoming social event. The cyst usually flattens within 48 hours - your dermatologist will be happy to discuss any side effects." After being papped leaving an L.A skin clinic, Kendall Jenner took to her blog to reveal that she used a laser to clear up a bout of debilitating acne - and there's method in the madness. "IPL (intense pulse light) treatments can often calm down outbreaks," says Hextall, "but I use this in conjunction with other topical treatments. IPL is fantastic at reducing the post-inflammatory redness. It is this redness that responds to the treatment; it attracts the laser brilliantly and shrinks the outbreak." While IPL is a great place to start, Mahto mentions that it's worth talking to a cosmetic dermatologist on the General Medical Council register to decide which treatment is best for your skin. "As well as IPL there are pulse dye lasers and other light sources that can help. Although, they may be a little pricey, some starting from £300 and upwards on average, and multiple courses are sometimes required." In case you hadn't noticed, skincare is getting pretty hi-tech - and LED therapy is causing quite a stir among specialists. "There is an increasing interest in the anti-inflammatory and rejuvenating properties of LED treatment to diminish acne," says Hextall. "Blue light is also anti-bacterial to P Acnes in the skin while red light is anti-inflammatory. Together, they are very effective and a lot of great work has been done to show that." "I am struck by how much cleansing and exfoliating occurs as soon as acne appears," says Hextall, "and in my view, this often makes things worse." That's right - constant washing, especially using soap products, will disrupt the skin's naturally acidic pH, in turn, disturbing the skin barrier, and if the skin is stripped of oil, it'll only produce more to compensate. Yes, it's a scary thought, but there's no need to worry! "Using a gentle, slightly acidic wash and applying a light moisturiser can be one of the most important changes when it comes to treating acne," says Hextall - so what does she recommend? "I like Cetaphil as an active topical treatment to apply during the day as well as La Roche Posay's Effacular Duo - it calms spots, reduces inflammation and keeps skin hydrated."